Beautiful Amelia Island ! Our condo is a deluxe two bedroom/two bath unit on the 1st floor in building b. Perfect for families or couples! We are located between two recently updated swimming pools. A boardwalk floats over the dunes and leads to the beautiful beach. Being on the first floor we offer a Hassle free walk to the beach and pools because it's just a walk around the corner from the unit. We have a private entrance from the parking lot. B107 is located in the center building of the Surf and Racquet Club . A NEW picture window in the living room offers a gorgeous view of the ocean as soon as you step thru the front door! Sliding doors open out onto two private patios. Our home sleeps up to six guests. The master bedroom is furnished with a king size bed. It has a sliding door that leads out to a private patio. The guest room has twin beds and a new sliding door to another private patio. Both bedrooms have private baths with tub/shower combos. The living room has a queen size sleeper sofa . It is a very comfortable and relaxing room with beautiful views. Two sliding doors open on to the each patio. Guest patio has an outdoor dining table and chairs for four. The master patio has four Adirondack chairs for lounging. We have beach chairs, towels, and toys for your use. Children will love playing on the thick green grass while you are enjoying and afternoon drink on the patio. Our kitchen is fully stocked with cooking essentials and a front loading washer and dryer. Amelia Surf and Racquet Club is located on Summer Beach. It is a gated community with 4 lighted clay tennis courts and two newly renovated pools. The Ritz-Carlton Hotel and Spa resort is located a short walk from our property. Wonderful restaurants and quaint shops make the historic town of Fernandina Beach a great place for dining and shopping. Fort Clinch, Cumberland Island, and St. Mary are nearby. If you play golf or tennis, you will have many venues to choose from. We have a tennis pro on site that is available for lessons or to help you schedule a match. This is a great tennis team get away location. All Surf and Racquet condos are individually owned and maintained. As such, each owner is responsible for his or her unit's decor and cleanliness. We take pride in maintaining the highest standards in both areas. Something will have been added each time you return for another stay. This condo is totally updated.. , Wifi, local and long distance, and hd/ cable is included. This is not just a rental property, it is our place to vacation also. Our hope is that you will want to come back year after year. Please read our reviews, we have several returning guests . We looked at several properties on the beach and this was the one that we loved immediately. Great location and great floor plan. Such a nice complex with wonderful tennis courts and beautiful beach. Well maintained. Being on the first floor makes going to the beach and pool easy and convenient. No elevators or stairs to manage or long walks from the parking lot. Covered Patios Off Each Bedroom Offering Beautiful Views and Easy Access to Pools and Beach. 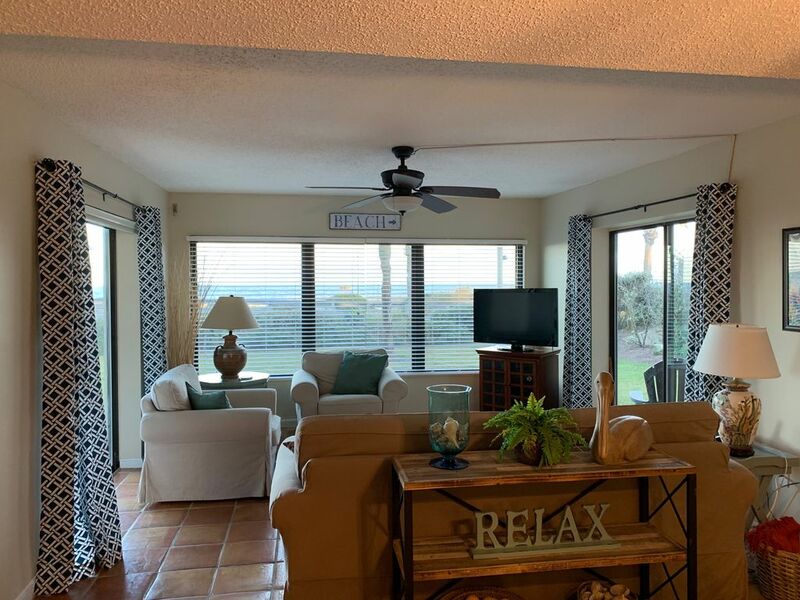 Beautiful Grass Lawn Off Patios Between condo and Beach, Stainless Steel Appliances, Front Loading Washer/Dryer in Unit, Spanish Tile Floors, Ceiling Fans in All Rooms, Updated Bathrooms. Relaxing, delightful stay in first floor condo. We loved our family time at this beautiful Amelia Island flat. It had everything for cooking, reading, walks on beach (ground floor a bonus) tennis courts. Well equipped with beach towels, chairs, sofa bed and close to market. Easy to contact owner who was quick to respond and answered questions promptly. Beach is ideal for running, swimming (though chilly in Dec) lots of shells and birds to delight. It was a quiet restful place, especially as no pets allowed. Felt like a home. Thanks for having us. We are so glad you enjoyed your holiday on Amelia. It is a wonderful place to relax and kick back. Please come back and visit during the fall, the weather is so nice and warm. 1st floor, right at beach access and pool. Spacious, comfortable condo. Great for a quick getaway. Please come back and stay again. We're so happy that you had a nice visit. Love this condo! You can tell the owners enjoy their condo and want it to be comfortable for their guests. I’ve stayed here many times and there is always something new that makes it even better than before. Thank you Dregers for making your vacation home available to my family! Better than a five star resort! We enjoyed our stay in this beautiful condo. We hope to vacation here again. Thank you! This was a nice and clean condo. It had a lot of extras that most condos do not. (Beach towels, chairs, beach toys, books, well stocked kitchen) It is also very private being an end unit on the ground floor. The owners are very easy to work with and immediately addressed the small problem we did have. I would definitely recommend staying here. Thanks Steve. We enjoyed having you. We had a small hiccup when we arrived, but it was easily and quickly remedied. It Did not impact our stay. I think the owner was more upset then we were ( showing just how much the owners care about their visitors happiness). We absolutely loved our stay here - we were so close to the pools and beach and the kids had easy access because it was on the first floor. I would recommend this place to anyone. We hope you and your family come again! If you love tennis , you will love playing on the 4 lighted, clay Tennis Courts, Lessons Available. Credit Card hold in lieu of damage deposit. Cancellation Policy: For stays of less than 14 nights: A Refund of deposit less $100 if cancel at least six weeks prior to arrival. No refund if cancel less than six weeks prior to arrival. For stays of 14 nights or more: A Refund of deposit less $200 will be issued if cancel at least three months prior to arrival. No refund if cancel less than three months prior to arrival.